Pippa O’Connor’s easy style and approach-ability has won her a huge and loyal following. Now Pippa shares her top tips and insights for how to live well, look good and feel great. Drawing on her own experiences as a model, businesswoman and busy mother, Pippa reveals how to look fabulous without spending a fortune. Whether it’s how to get ready in 10 minutes, wardrobe essentials for every woman, or being the hostess with the most-est (without slaving in the kitchen! ), Pippa’s engaging mix of stories and practical advice shows that everyone can be stylish. Stuffed with tricks, inspiration and beauty secrets, this is a book for everyone, aged 16 or 60, who wants to discover their own personal style and to build the confidence to celebrate it. I want to start off by saying this book would be aimed at me. My age, my interests and I like beautiful pictures in books. I love beauty and I love to read what the next best thing in the beauty world is. I buy too much make up and creams. My husband says nothing because at 35 I still look like I could be in my 20’s! Fact I grew up with a great mother who encouraged us and told us always to look after out face, skin and teeth. These are the areas that will always give away a woman’s age! I was excited to see what Pippa’s tips and tricks would be like. Disappointing doesn’t even cut it. 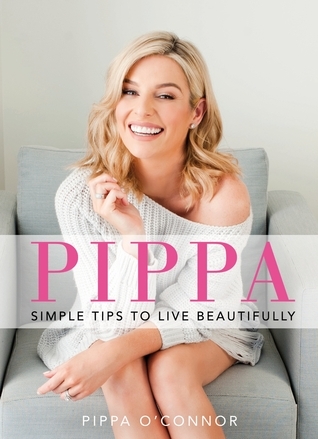 ‘Simple Tips To Live Beautifully’ is the name of this book, But really Pippa was born with great looks and looks after herself, that’s it! This book could have been, half the size and yes her pictures where beautiful but a book this size and price needs to have more than just pretty pictures. I could have written a better book and probably would have had less typo! I know, I know I can’t talk I can barely spell, but I don’t get paid for my reviews so I think I can have a few wrong spellings here and there. She had by my count more than 20!! At one point L’Oréal was slept wrong. Ek how embarrassing! In conclusion this was so disappointing and if I had bought it instead of getting it from the library I would want my money back.